Carnival Corporation and Rainforest Adventures celebrated the official grand opening of the Rockland Estate eco-park attraction on April 11, 2018 in St. Maarten. To mark the occasion, a ceremony was attended by esteemed government officials, as well as Rainforest Adventures president Josef Prescel and key Carnival Corporation officials. With financing from Carnival Corporation and built by Rainforest Adventures, Rockland Estate is set to quickly become one of the most popular attractions in the Caribbean. It features the world’s steepest zip line, a mountain chair life with gorgeous views, and a heart-racing tube ride. For those that don’t care to get their adrenaline pumping, there’s also a museum that showcases the history and culture of St. Maarten and its people. Guests from eight of Carnival Corporation’s brands with cruises visiting the island will have the opportunity to experience the new shore excursion. Here are some details on the rides and attractions at Rockland Estate eco-park. Soualiga Sky Explorer: Soualiga Sky Explorer encompasses 68 four-passenger chairs that take guests to a transfer station for zip line and tubing rides, and then on to the top of one of St. Maarten’s highest points at 1,125 feet for panoramic views. 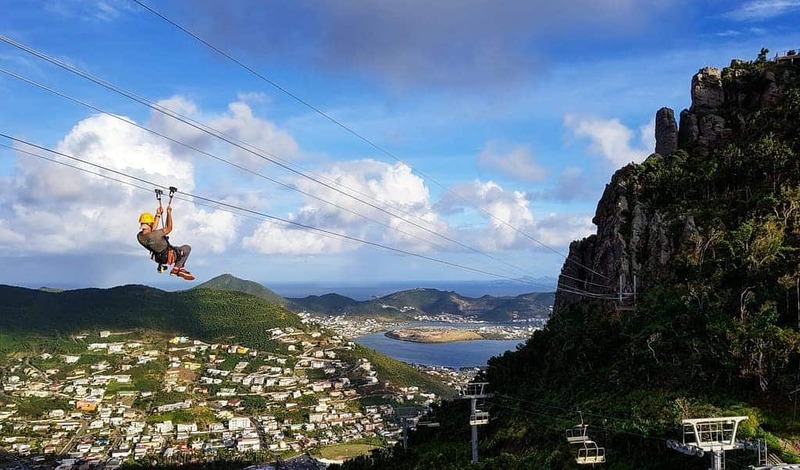 Sentry Hill Zip Line: From the transfer station at the midpoint of the Soualiga Sky Explorer, guests can take a ride on the zip line, where riders traverse a 1,600-foot, four-span line that provides unforgettable mountain views. Schooner Ride: The Schooner Ride at the midway point of the Soualiga Sky Explorer gives guests the chance to surf down the mountain in large 40-inch inner tubes across a specially-designed 657-foot track of heart-pounding curves and fast straightaways. Top of Sentry Hill: One of St. Maarten’s highest elevations, Sentry Hill, offers walkways and platforms that encircle the mountaintop, showcasing 360-degree vistas of the island with views of neighboring Saba, St. Barts, St. Eustatius, and Anguilla. Flying Dutchman: The Flying Dutchman is Rockland Estate’s main attraction and the world’s steepest zip line. It guarantees the ride of a lifetime while securely harnessed in a chair, dropping visitors 1,050 feet from the top of Sentry Hill down the mountain over a 2,800-foot span. Carnival Corporation also partnered with Rainforest Adventures to develop Rainforest Adventures Jamaica at Mystic Mountain in Ocho Rios – a mainstay of Jamaica rainforest activities where guests can travel from the seashore to 700 feet above sea level at the top of a mountain. The company also worked with Rainforest Adventures to design and built the Magical Flying Beach Chair at the Carnival’s Mahogany Bay Cruise Center in Roatán. The chair lift system takes cruise guests from the welcome center to Mahogany Beach via a six-minute ride across nearly 1,200 feet of suspended cables.